You wouldn’t think that a dish as simple as beef and rice could defeat a Monday. That’s because Monday has climbed into your head and started playing games with you and now you can’t even trust your own thoughts. Trust us. Rice. Beef. Pickled vegetables. David slays Goliath because he has goodness on his side. Now go. Crush your Monday.Inherit your kingdom. To cut the beef, start with the meat partially frozen. Cut down the center of the steaks. Turn all pieces of meat so their cut sides are on the cutting board, then thinly slice against the grain into ⅛ inch pieces. In a large bowl mix the garlic cloves, brown sugar, sesame oil, soy sauce, green onions, salt and pepper. Toss with the beef and let sit at room temperature for 30 minutes, or chill up to 8 hours. Heat a grill or large skillet (with neutral oil) set over high heat, and cook the meat. This step does not take long, because the meat is so thin. 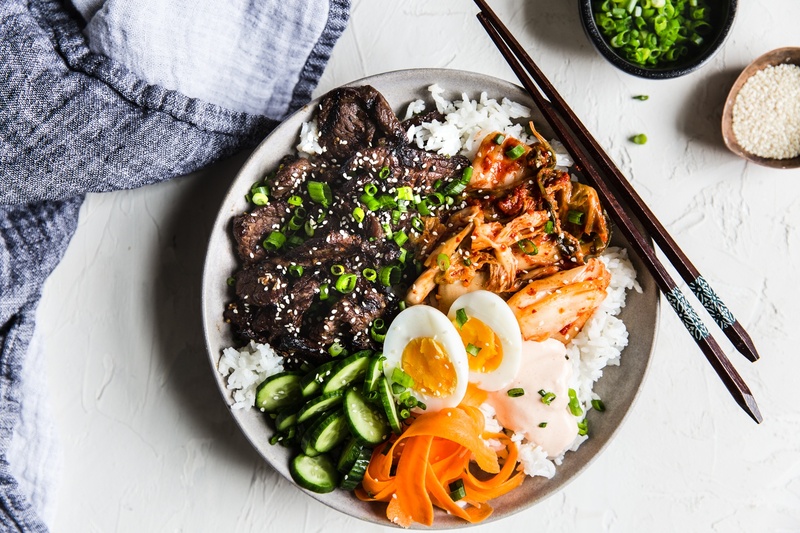 Divide the rice, vegetables, soft boiled eggs, kimchi and bulgogi into 4 bowls. Top with sriracha mayo, green onions, sesame seeds.